Info: This feature requires the Elvis InDesign client version 3.1.0 or higher (shipped with Elvis 5.19 or higher). This article is part of a series that describes how to use Elvis 5 with Adobe InDesign. In this article, the process of enabling logging is described. To troubleshoot technical issues that may occur when using the Elvis InDesign client, logging can be enabled. Each scenario is described below. 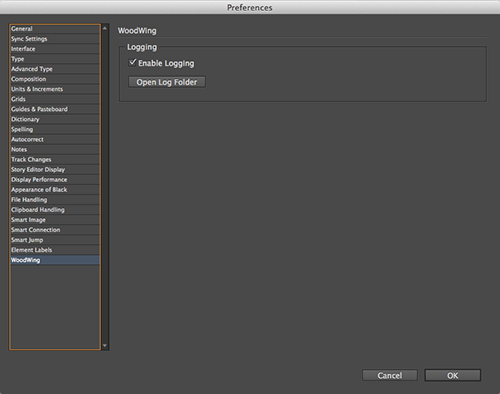 Enabling or disabling logging is done through the preferences of InDesign or InCopy. Default logging areas and logging levels are used which cannot be modified. The names of the log files are Log_InDesign.txt, Log_InCopy.txt and Log_InDesignServer.txt. The Logging folder can be quickly accessed through the preferences of InDesign or InCopy. Enabling or disabling logging is done by modifying the WWSettings.xml file or through the preferences of InDesign or InCopy. When logging is enabled through the WWSettings.xml file, the logging areas and logging levels to use can be specified. When logging is enabled by setting the Preference, default logging areas and logging levels are used. Depending on the installed plug-ins, separate log files are created for Elvis and Smart Connection or the logging is combined into one file. For Elvis or Elvis and Smart Connection combined: Log_InDesign.txt, Log_InCopy.txt and Log_InDesignServer.txt. Enabling or disabling logging is done by modifying the WWSettings.xml file (by system administrators), through the Preferences in InDesign or InCopy (by end users), or through scripting (for InDesign Server). This method is for system administrators who want to make sure that users use a specific method. When setting the method through the WWSettings.xml file, the corresponding Preference in InDesign or InCopy (see below) is disabled, thereby preventing these users from changing the setting. Enabling logging is done by enabling the logging for Smart Connection. For more information, see Logging Smart Connection activity. Note: When the system administrator has configured the setting through the WWSettings.xml file, the Preference cannot be changed. After setting the option, logging is immediately affected. The logging functionality is made available through a specific plug-in that is shipped with the Elvis InDesign client and another plug-in that is shipped with Smart Connection. 1 Logging should be enabled through the WWSettings.xml file. 2 Logging should be enabled through the Preferences. 3 When logging is enabled through either the Preferences or the WWSettings.xml file. 22 November 2018: Renamed from 'Enabling logging for the Elvis InDesign client for Elvis 6'.